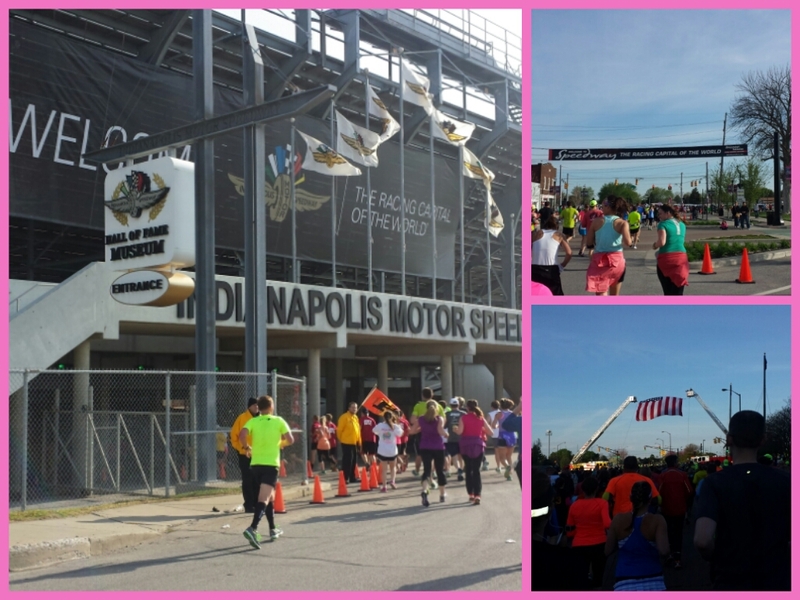 The One America Indy 500 Festival Mini Marathon, better known as the “Indy Mini” is the largest half marathon in the country. I heard about this race from a race expo last year and knew it would be on my 2014 race schedule. My Mom and I arrived around 4pm on Friday. Parking was a breeze in the Convention Center Garage. I was expecting mega crowds. Thank God it was nothing like the Marine Corps Expo where I stood in line for hours just to get inside. The packet pickup was clearly marked with signs in the back of the hall. 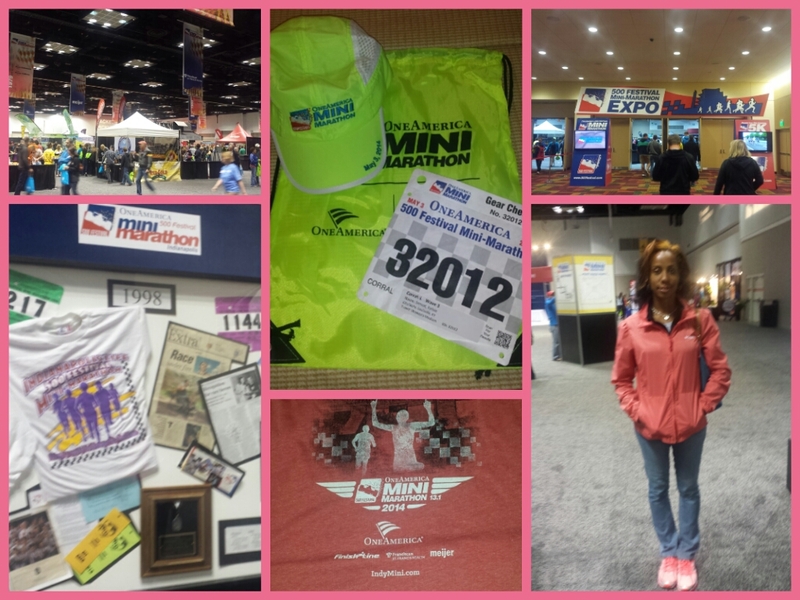 I grabbed my bib, shirt and hat before checking out the vendors. There were way too many headband companies. I didn’t see any gear worth buying. There were only a few promotions for upcoming races. Overall, the Expo could have been bigger and better to match the hype of being the largest half in the U.S.
We left the Expo and checked into the hotel. The Olive Garden was my choice for dinner, then back to the room to relax. I slept good, got dressed and made my way downtown. I thought it was going to be packed, but I didn’t have any problems finding parking at the IUPUI lot for $5. It was located just 3 blocks from the start line. My second order of business was finding safety pins. I did not get any at the expo. I asked a few people until I hit the jackpot. 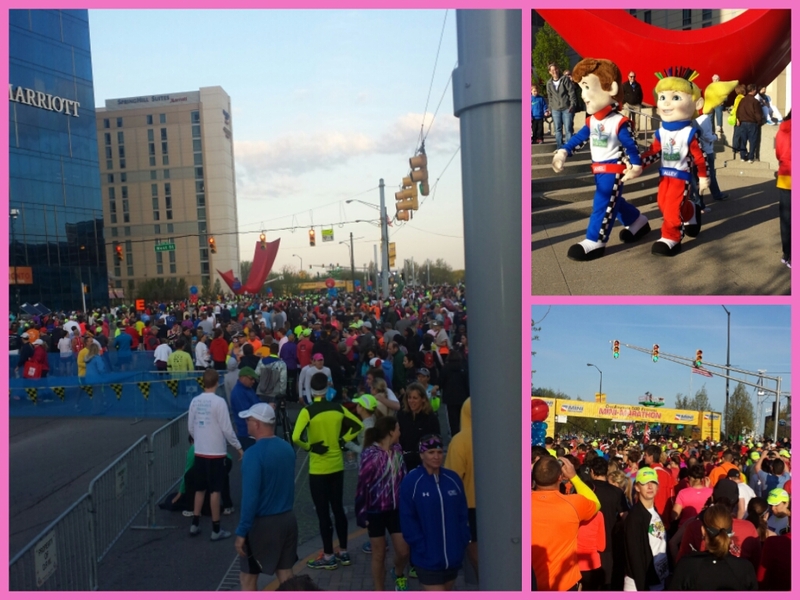 With a field of 35,000 runner, the race organizers did a wave start system. I was assigned to Corral L which I decided stood for “Lou.” The volunteer was the livest from A to Z. I was so happy to be in her corral. At 7:15, the 5k runners started their race. The Wheelchair division went next, followed by the Elites. I was so impressed by the organization and open feel despite being around thousands of people. The Indy Mini wave starts gave each group it’s own start line experience. I waved and blew a kiss at the channel 8 news. My Mom got to see me on TV. At 8:15, Wave 3 made our way across the timing mats. We were lead by a ROTC group from IU. The sun was towards our backs and the wind was beating our faces. I was a little aggravated by people who obviously jumped corrals and were walking. That’s just rude! I didn’t let the dishonest people get to me because that’s not a healthy mindset to have while running. My goal was a reacheable sub 2:00 time due to taking a ton of photos and a two week cram session of training. The bands along the route helped me enjoy the race as I peeled off my sweatshirt. I loved the diversity of bands and performers. They were all jammin’. There were pit stops for water and gatorade at what seemed like half mile intervals. I skipped the first 3 or 4 miles of fluids but figured I better drink before I felt thirsty to play it safe. The pit stop volunteers were the greatest. They were energetic, motivating and happy to help. There was a huge group dressed as clowns. The wind was killer. I decided to embrace it and lift my hat to cool off. At one point it almost blew off my head. I told my Mom I wanted to run 9:00 splits. Turns out I was below that time, especially on miles 2 and 4 with 8:18 and 8:14. The music really gave me energy. Spectators were in full force along Main Street leading into the Indianapolis Motor Speedway. IU Cheerleaders welcomed us inside the Speedway. 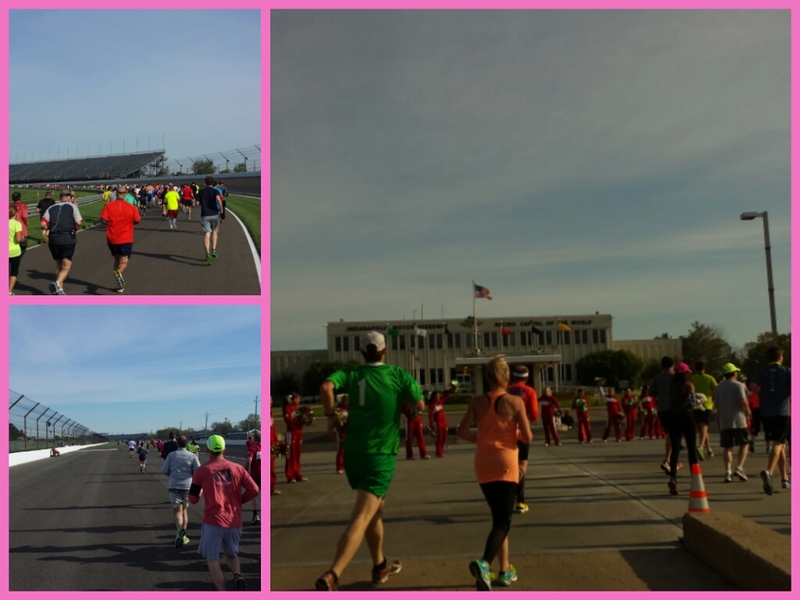 I was curious how it would feel to run the slanted race track but we were actually on a flat inside paved section. One of my favorite hype squads was a group dressed in banana costumes. They were so cute and had the best signs. The final stretch leads to the yard of bricks which is kissed by the Indy 500 and Brickyard 400 winners. I read that the yard of bricks is the last remaining section of what was once an all brick track. I told my Smoodents that I was going to kiss the bricks and they advised me not to because of people’s feet. They suggested I blow a kiss instead. Once I reached that point, I took the time to kneel and kiss the bricks for good luck. The marathon photo crew was set up and if my photos are cute, it will be my first time paying 20 bucks for a race photo. I didn’t see a lot of people doing personal photos and I didn’t want to disturb anyone’s time goal by asking. I didn’t study the course beyond the Speedway and five miles didn’t seem like much. Out of no where I got all emotional and in my feelings. I felt my airway constricting. My breathing was shortened and it was something I’ve never experienced. Moments later, I snapped out of it and pressed forward. Those head winds returned and I took a sip of water with a few walking steps to regroup. I saw 1:08 on my Garmin after mile 8 and knew I could reach my 2:00 goal. My next challenge would be to PR. I opened my WordPress app to find the post about the Sports Commission Half back in October. My time was 1:53 and some change. My new goal was to beat it. The course entertainment never let up. I did the YMCA dance as I ran past one group. This DJ lady was blasting Play at Your Own Risk by Planet Patrol. It got me so hyped! My Mom called and I told her I had two miles to go. I was getting tired and wondering where the heck was the finish line. I passed a reggae band and some belly dancers I remembered seeing on the way out. I knew the end was near. I was shocked when I saw an 8:11 mile split for mile 11. I dropped to 8:15 on mile 12. Finally a tail wind! The last mile was flat with a very slight decline. It was so flat that I couldn’t see the finish. My Garmin was slightly ahead of the official mile markers. Going down New York Street was a wonderful experience. The crowds were deep and bleachers were set up right near the finish. It hurt, but I managed to squeeze out another 8:11 split. I got emotional again but I had every right too this time. I set a new PR of 1:51:02! I think the atmosphere was a major factor in me pulling through. This was the first time I negative split the 2nd half of a race. I marched through the finish chutes and grabbed all my goodies. I had to skip the finish festival because I needed to check out by noon. Traffic was a breeze leaving the parking area. I zoomed back to the hotel and showered. I called my mentor, Steve Babcock and we met for lunch at Aristocrat. My Mom and I stopped in Saks inside The Fashion Mall at Keystone for some retail therapy. Then, it was back to Da Ville to catch the final race of the KY Derby. The day was not over! I still had to stay up and watch the Mayweather fight with my Dad. Talk about a long, sports filled day. I wouldn’t have it any other way! I highly recommend the Indy Mini. It was the best organized and highest entertaining race I’ve ever ran. A course record of 1:01:53 was set by Kenyan, Nelson Oyugi. He broke the previous record by 6 seconds. 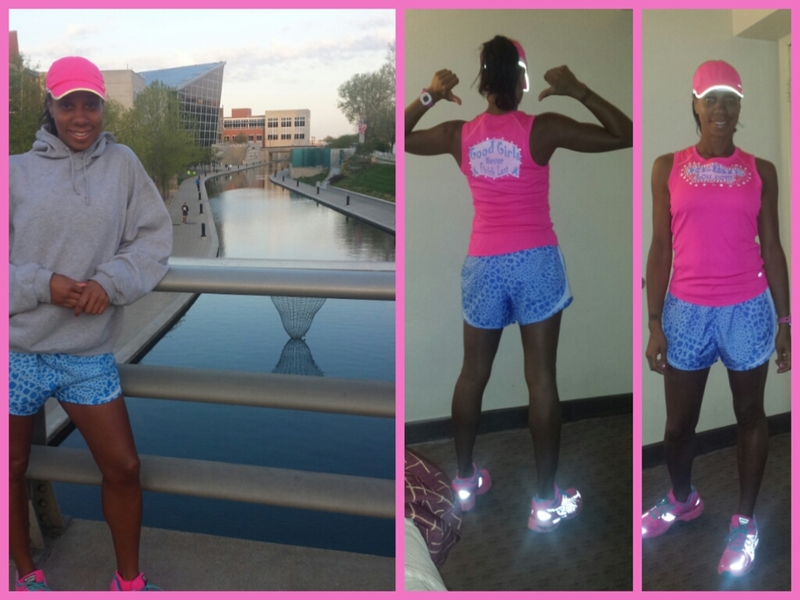 This entry was posted in fitness, running and tagged half marathon, Indianapolis, Indy 500, Indy Mini. Bookmark the permalink. Great race and a great race report. I love your race-day outfit! Nice job! Thank you! I designed the shirt on my computer, printed, ironed on and embellished with rhinestones. WOOOHOOO!!! Always a PR setter, you are!! So proud of you!! Seriously!! I loved this race when I ran it back in 2012. LOVED IT! 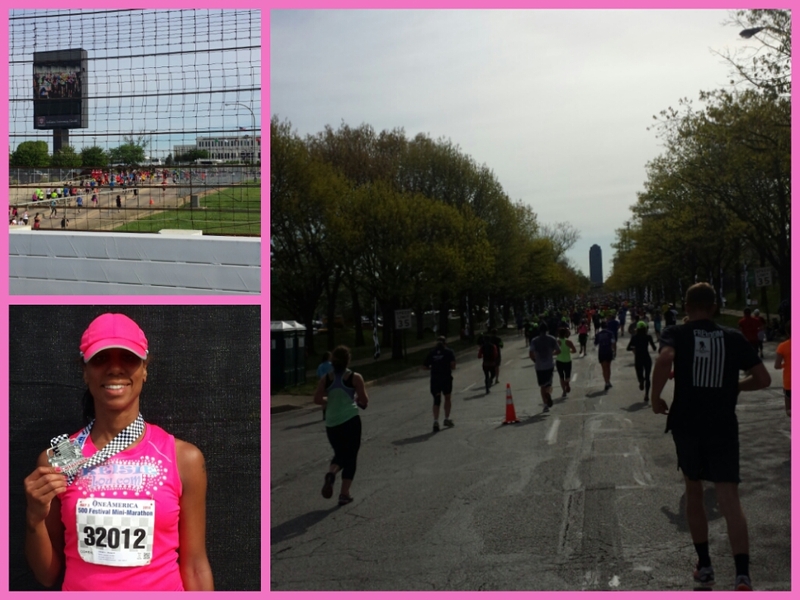 It was my 2nd half marathon and I had a great time. I keep meaning to return to it, but I always seem to be busy on that weekend. Thanks Karen! I want to shave some more time off the 5k next. You and me both…but I’m still not ready to push harder yet. This ankle injury has really done something to me mentally. I need an extra push. You are SO amazing at these short fast races…I have no doubt you’ll kill your next 5K. Take your time and heal. PRs can wait! Exactly…but that is so hard to wrap my head around. I keep comparing times to where I was last year…and that just frustrates me even more. I think it’s our nature to think that way when we are passionate about something. Our strive for excellence is what makes athletes so unique. With running, we get immediate results with feedback from every stride. Don’t worry because you have the heart to make those goals once you are 100% mentally and physically healed. Congrats on your PR! So cool that you go to run on the race track. We did the same at the race track at Disney during the marathon. I thought it was a really cool experience that not a lot of people get to do! Thanks Scott! Wow, I didn’t know Disney went around a track also. I see a Disney race in my future. Yes, they put all sorts of fancy antique cars on it as you do the mile lap. They only run it in the full marathon though, fyi. Congrats on a great race and your PR! I love that you were able to take so many pictures during the race. 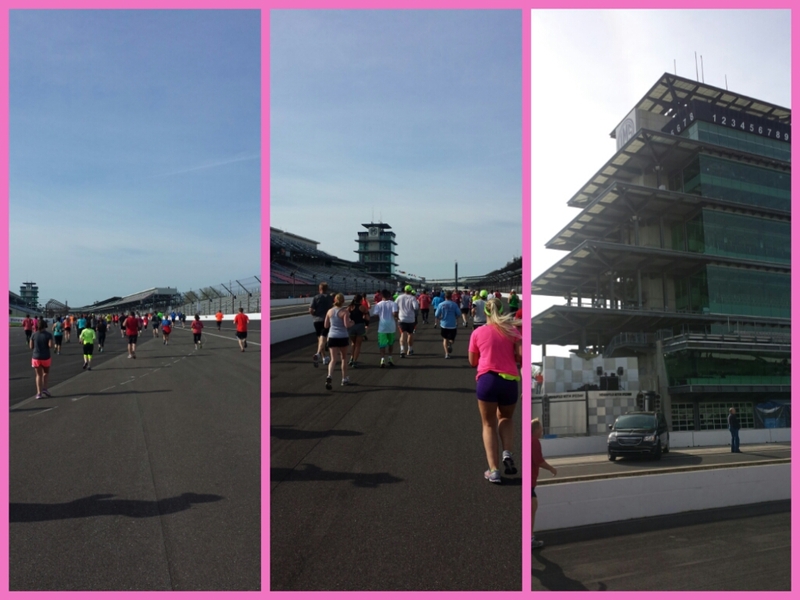 This was my first time running it and I was really impressed with the race and organization. If you want to run it next year make sure to submit a race time so that you can be seeded. 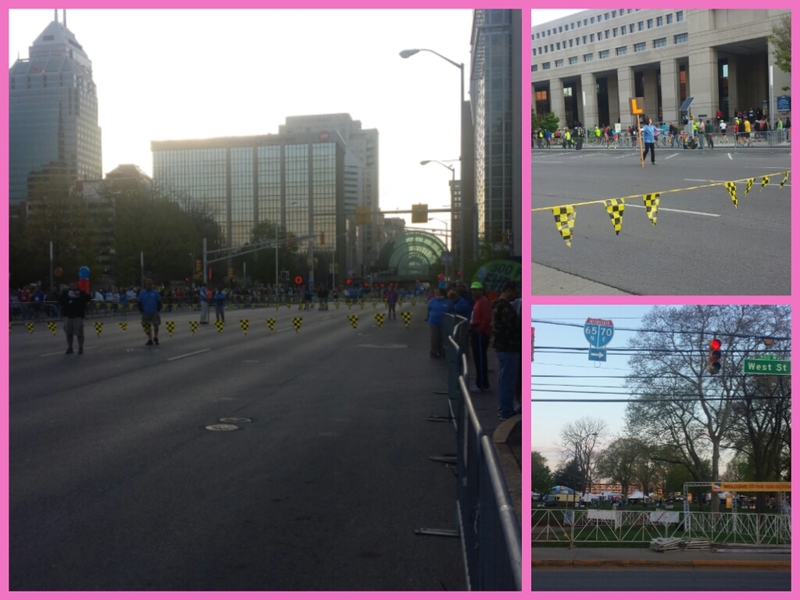 I was in corral D and there were no walkers in the first few miles which made the start of the race really enjoyable. The PR was totally unexpected. My legs are still recovering…mainly inner thigh muscles. I need to invest in a Go Pro for my love of pictures because the phone was a bit of a nuisance. I entered a finish time of 2:00. I would need to be super fast to get up there in D.
I love GoPros! Someone posted a video of the race and it was fun to watch some of it. I entered a finish time of 2:00 and they put me in D. Weird that they put you so far back . That is weird I was so far back. I registered about 2-3 weeks prior so that may be the reason. Congrats! On a job well done!! You go girl!!! Thank you so much! I was trying to find a race in the Detroit area for 4th of July weekend. So far, everything is too far for what I’m willing to drive. Hello hello fast mama! Congrats on the PR!!! Congrats on your 1st place age group win! Someone told me you get faster as you get older. I talked to this one lady who had to be late 40s and looking fab. She was in a seeded corral C spot. So, as long as we keep doing what we do, those PR and awards will continue to meet us at the finishline! Great weekend. Loved our mother/ daughter time together. I appreciate the 300.00 bottle of Creed perfume. So fortunate to have a daughter who makes every day a special day for me. Anything for Mom. We need to lock in our Vegas trip. Congrats on your PR! This seems like a fun race. Kissing the bricks is just a cool feature! Thank you! It was a blast! It makes me want to go to a Nascar race now.